I feel like this world is in up-sizing mode. We want bigger houses, bigger/better cars, bigger meals, more expensive things, and on and on. When we bought our first home in 2009, I will admit that I thought bigger was better. We bought a 100 year old home, so it wasn't the newest and nicest house, but it was big. And I loved that about it. I quickly found out that an almost 3000 sq. ft. home is a lot of work to keep up on. Impossible to have it all clean at the same time, honestly. Well, we recently moved from that home into a 950 sq. ft. home with an unfinished basement (which we have since been working on finishing and just have a few things to finish up, but the basement is live-able now). Honestly, we were terrified. We weren't sure what we were getting ourselves into. 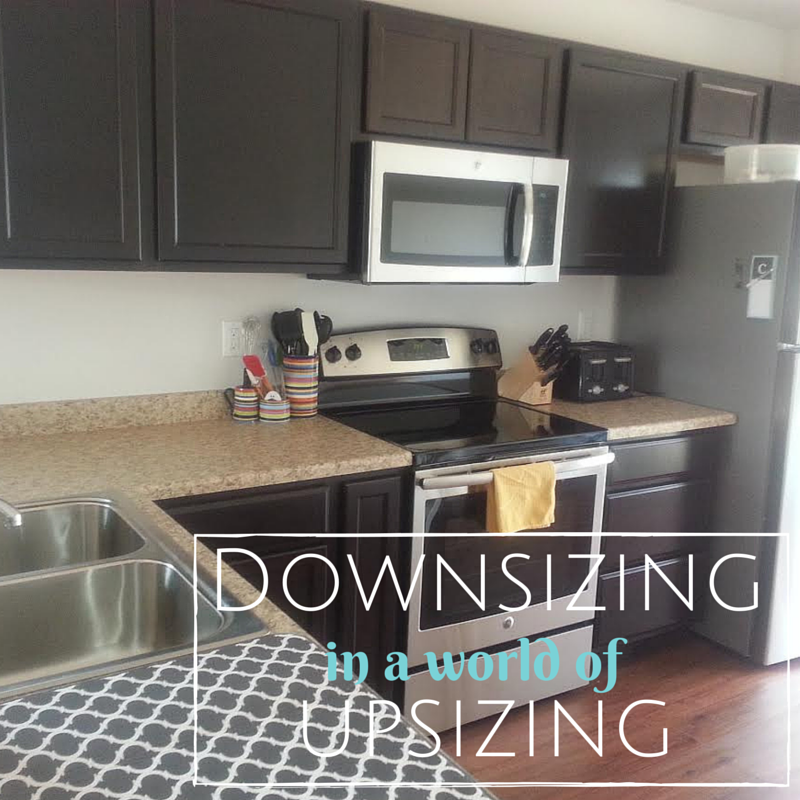 We knew we'd have to downsize some when we moved, and I really wanted to because that house was just too much work, but we didn't think we'd be moving into a house the size of our first apartment. We went from having 5 bedrooms with 2 "bonus" rooms and 3 bathrooms, to having 2 bedrooms and one bathroom. I'll never forget the day that the opportunity for building this house presented itself. We had been looking at other lots through this program we were building in, but none of them were right. When we found out about this new lot, we were immediately intrigued, but shortly after, we were told that there was only one floor plan available to build on this lot. And that floor plan happened to be a two bedroom, one bathroom. Eek! We were just not sure if we could make it work. Besides the large amount of stuff that we owned, our kids had never shared a room, and we both really love hosting and weren't sure how to do that in such a small space. Long story short, we decided that we were willing to sacrifice more space for other things that we wanted in a house. And I am so, so glad we made that decision! We were recently out on a bike ride, and I asked my husband: now that we've gone through the whole process, downsized and have been living here a few months, do you think we did the right thing? He said without a doubt, 10/10, 100% yes. I agree. Being able to let go of so much of the materialistic stuff in our lives and focus on being more minimal has been a blessing to us. We are still working to get there. We had a lot of stuff. We totally became the people who friends and family pawned all their old junk off on because 1) we had the space for it, and 2) my husband is kind of a sucker when it comes to things like that. We got rid of so many van loads full of stuff before we even moved and have gotten rid of so much more since we have moved in and been unpacking! We are a work in progress, but I have loved just getting to focus on the important things in life. Having 1000 sq. ft. to live in for several months wasn't one of those. It was fine. We made it work, and actually I kind of love it. I can clean the whole house super fast, I can be in the kitchen and hear my kids playing in their bedroom, and I have to be picky about what stuff I'm keeping and how I'm organizing things. The fact of the matter is that we are beyond blessed to have this home. Not buying it because it was "too small" would have been silly for us. Sure, we had valid concerns, like how we would be able to host gatherings, which is important to us...especially as a family in ministry, but God has worked all of that out. We've hosted many life groups and a few larger gatherings already, and it has been totally fine. I could see God's hand in all of the little details of this move so much more than ever before. Every little thing that had to go right for this to work out, every time that He seemed to drop money in our laps when we'd find out about something else we had to pay for, etc. It made me think that it was His way of telling us this was the right move. I am really excited about continuing to learn to live with less. To be thankful for what I do have. To break the mindset of wanting so much unnecessary stuff. With the completion of our basement (mostly) we have added another living space, a bedroom and another bathroom. This will certainly help out some, but it's only another 450 sq. ft. It has been fun figuring out how to utilize the space to its fullest potential and to customize it to make it work for our family. Now that we are used to living in a smaller space, I could honestly see us staying here for a long, long time. It feels so homey and so "us" and I love that about it. I love that it's just what we need, and not a lot more. I love that God showed me how much I was holding space and things as an idol...they were wants, not needs. And I love that we are learning to be content with much less. I feel ya! Our house is bigger than our last but not by much. I like "regular" sized houses...mainly because I have to keep it clean! Glad you're liking it. I love how it forces you to not hold onto things and to frequently purge. I know we will build a bigger house in the near future but I hope to hold onto that mindset! The basement sounds wonderful! I liked reading this post - I have been working on cleaning out our house again, because all our extra stuff is just bothering me! I like the idea of just having what we need and actually use regularly.